There is some disagreement on whether this plant is native or not. Achillea millefolium is a plant omnipresent in Europe and Asia, and most think that it was introduced in North America in early colonial times. Others seem to think that there is a native species, although it is indistinguishable from the Eurasian plant. I’ll consider it an invasive. Yarrow likes sun, but does ok in partial shade. Yarrow is drought tolerant and is generally resistant to insects and disease. 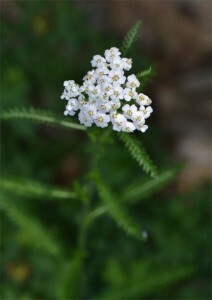 Yarrow has white flowers, but you will find yarrow cultivars in many colors. 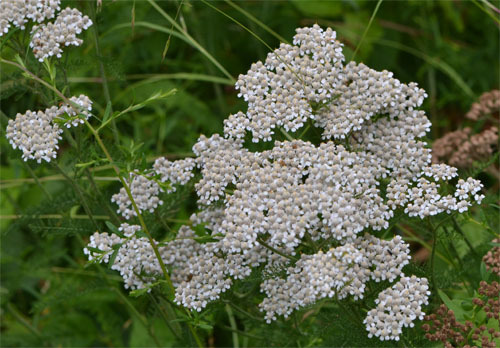 In a topical application, yarrow stops bleeding, contracts skin tissue, inhibits bacterial growth, heals tissue, acts as an anti-inflammatory, and acts as an anesthetic. When used in a tea, it raises the body temperature and makes you sweat. As a tonic it stimulates digestion, lowers blood pressure, and slows your heartbeat. The plant is also edible – as mentioned earlier you can drink it as a tea or tonic, and the plant has been used to flavor beer, wine, and soft drinks. The leaves can be used as a seasoning . Young leaves can be boiled or added to salads. As with anything, moderation matters! Over-exposure to yarrow can make you sensitive to light, although studies have shown no appearance of fangs. Some individuals are allergic to the plant and will get rashes when handling yarrow.